LAST NIGHT, EDWARD Snowden posted the following tweet. 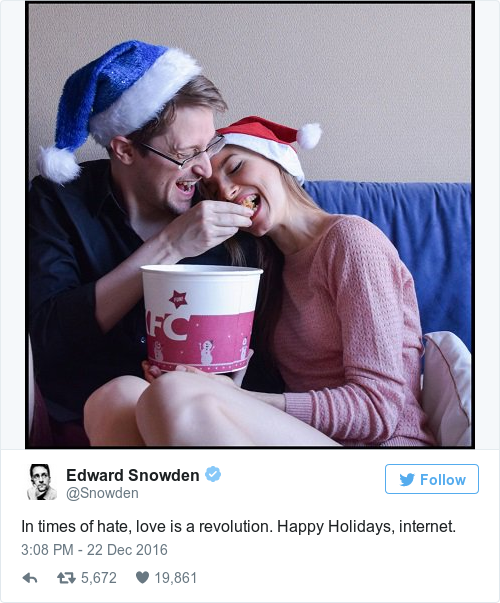 Accompanying the text was a photo of Snowden feeding his girlfriend, Lindsay Mills, fried chicken from a KFC bucket. Er, festive. But the tweet confused many. Given the prominence of the KFC logo, people began to wonder whether or not Edward Snowden was now doing sponsored content (#SPON #AD) for KFC. In fairness, it wouldn’t have been the weirdest thing to happen in 2016. Last night, Snowden put the whole thing to bed once and for all, and confirmed that it was not a sponsored post, but instead “just something we do”. 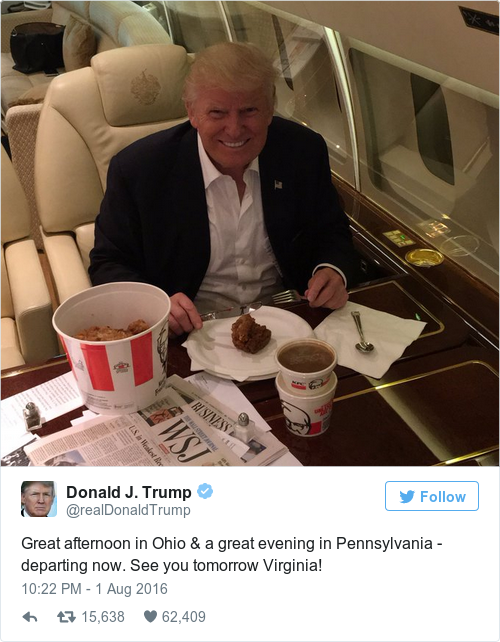 Snowden’s girlfriend Lindsay Mills posted the photo on her blog a few days ago and elaborated on the couple’s fondness for KFC. Holidays are about traditions, laughter, and memories. This year we adopted the Japanese tradition of KFC Christmas chicken. And it brought out our silly side. The little connections that bring us all together are what makes this time of year so magical. Whether you’re celebrating old traditions or making new memories, we hope you all have a wonderful end to a wild year! What a year for KFC, eh? Email “This photo of Edward Snowden feeding his girlfriend KFC confused a lot of people last night”. Feedback on “This photo of Edward Snowden feeding his girlfriend KFC confused a lot of people last night”.